John and I drove into Prescott to Doctor Caccavale’s office, the Arizona sun of late February glaring in our eyes. Leukemia had made my husband’s pale complexion transparent, but he chose to do the driving. I squinted at the San Francisco Peaks in the distance, noticing a sunlit dusting of snow on the two points. The doctor told us that John had only a short time left. “I can’t imagine what you must be feeling,” I told my husband later, on the way home. The rattling of our old Chrysler annoyed me; the car should have respected the gravity of the news we’d been given. “I’m not surprised…just stunned, I guess,” John said. “I’ve had a year to get used to this, and it begins to become sort of…real. It doesn’t scare me most of the time.” We didn’t speak for a while, and the car clattered along. “Caccavale said it would be painless if it’s a hemorrhage,” he added, his blue eyes hidden behind his aviator sunglasses. “I know…I think we should get Hospice right away,” I said. When we arrived home, I followed my husband up the stairs from the garage, aware of the effort for him. His khaki pants hung loosely from his belt, and I noticed the heavy cords at the back of his neck. Sitting on the couch in front of the muted television later that month, John frowned at the tumbler of bright green vegetable juice in his hand, a celery-smelling concoction developed by a scientist at Yale. While the Gulf War sparked and streaked across the screen, my husband drank part of the mixture and headed for the bathroom where he vomited the formula. I called Hospice, and they reached Charlotte—a neighborhood Hospice volunteer and member of our church—who came over immediately. Arrangements were made for a protracted confinement, but in three days Charlotte awakened me from a nap in time to take John in my arms. He was going, she said. His breathing slowed, and he stared upward as if trying to see something. Then I felt he’d gone, even before he moved slightly and sighed into a gentle death. In May I returned to my work as minister at a Congregational Church in Dewey, Arizona. We were a small church in the northern high country, and I’d been the minister there for five years. Nothing special about that, except I was a woman in a profession from which women had been excluded for two thousand years. I seldom felt loneliness after John’s death. Maybe it was the attentive church members, or the restoring landscape of Arizona’s north country, its mountains, multi-colored canyons, and electrical storms. One morning that spring, considering sermon preparations, I sat in my office enjoying the view outside my window. The desert scene of Manzanita brush was punctuated with new wildflowers in purple and white, and the Bradshaw Mountains in the distance stood as constant as God. I knew I wouldn’t be disturbed. Our fussy choir director had been fired. I had no secretary. No one would need to fix the heater or sand down the peeling front door. I reread the account of the wedding at Cana in the New Testament. Jesus, the story goes, transformed water into wine to provide for the guests at the party. How does life become wine when it’s been thin and watery? That’s got potential: water into wine. I was wrong about my privacy that morning. I heard a knock at the church door. When you try to do as Jesus would have done, you open doors and welcome whoever is there, but I glanced through the peephole before I opened the door to a small man in grimy clothes. He took a step back, as if confronted by the evil eye. “You ain’t no minister! I wanna see the real minister!” He got smaller in his retreat, his hands held in fists. “I assure you—” I started. I had no answer for that remark, feeling as absurd as this man characterized me. “I can’t talk to you. You ain’t even got a Bible!” My visitor took some choking breaths and moved away, his halting crooked pace as slow as my husband’s. Back in my office, after the encounter in the doorway, I took a sip of cold coffee. My visitor’s words, “You’re a woman, for Christ’s sake,” rang in my head. Some day I’d remember that as funny. I looked at my notes about changing water into wine but couldn’t concentrate. I thought of the absurdity of my being here in the Arizona desert, a recent widow who’d been insulted by a man who wanted me to carry a Bible. That was funny too. Changing the water of entrenched ideas about male clerical leadership into the rich wine of a diverse clergy could not be done, as Jesus did, at a party. It would take people like me doing our job. I did not feel like a pioneer for women’s rights; I preferred to imagine myself a movie star in a filmy gown. My choice to leave my life as a high school teacher and go to Berkeley to prepare for ministry astounds me. That I sought to offer leadership in the Christian Church is an example of how we stumble into things and then figure out later what got us there. I do know I had a need to enter into holy places and learn about the religious spirit. I’m not your conventional Christian. I cannot believe Jesus was a savior sent to redeem the world’s sins. Such faith I leave to others. I consider Jesus a fine Mediterranean teacher and leader, a radical iconoclast burdened with new ideas. Those conclusions about Jesus make me more of a radical than I take myself to be. I’ve annoyed plenty of folk, like the caller at the church door, but I never intended to cause a fuss. I’m a tall, plain schoolteacher type—brown eyes behind glasses—who ought to be on the silver screen. I ended my time at the Congregational Church a year after John’s death. By then, the members of our little church had undermined my snobbery, cleared my theological head, and listened to me. They stood beside me through John’s illness too. Being with them softened my guilt and dissipated my grief, transforming the water of my days into the wine of recovery. I wish I’d done a better job as their minister. If I had another chance, I hope I’d give up my biases—against annoying talkers, conservative believers, self-righteous ideologues—that emerged in me during my ministry. I like to think that next time I’d have more courage to challenge bigotry against clerical women. There will not be a next time, of course, but I have some new understanding of how difficult leadership is and how many times our bumbling is the best we can offer. I’ve a bit of empathy for George W. Bush who’s made choices that must, I hope, cause him to shudder. Before she had a ministry in Arizona, Elaine Greensmith Jordan was a schoolteacher in California. She recently has been published in Storyhouse, Inkslingers, The Georgetown Review and an anthology, From Writer to Readers. She has a completed memoir on her desk that she'd like to publish before she dies. 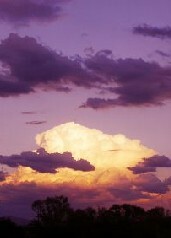 Photo "Storm Coming In" (cropped), courtesy of Yvonne Stepanow, Cottonwood, AZ.